HABIT: Upright and open, beautiful round leaves. Several cultivars are available with a wide range of yellow, red and purple spring, summer and fall colors. Smoke-like false flowers in mid summer. CULTURE: Tough plant, any soil, drought tolerant. Needs excellent drainage. USES: Specimen, foliage color, unique flowers. PROBLEMS: Few if any in well drained soil. 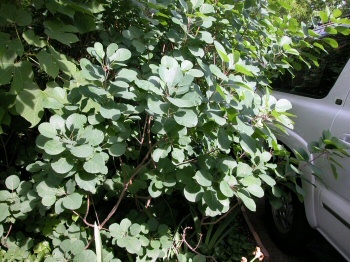 NOTES: Cotinus coggyria is the introduction from Europe and Asia. Two good purple leaf cultivars are ‘Royal Purple’ and ‘Velvet Cloak.’ Continus obovatus is the native with fall color that changes from yellow to apricot to scarlet. Its foliage is green in the summer.